Majority of the Asian and African children live with malnutrition. About 30% of the children in sub-Saharan Africa have the problem of protein energy malnutrition (PEM), and the eastern African region is the worst hit area of the world. Malnutrition is still of great concern in resource-poor countries, and it accounts for about 50% of under 5-year mortality; this amounts to about 3 million deaths/annum. The United Nations Human Development Index in 2006 estimated that 70.8% of the Nigerian population live on less than one dollar a day, while 92.4% live on less than two dollars a day; this observation, coupled with ignorance, and diseases such as diarrhoea and measles form the perfect cocktail for malnutrition. Serve acute malnutrition (SAM) affects all the body systems including the skin. The exact mechanism of skin change in SAM is not completely understood, but the role of micronutrient deficiencies such as zinc and vitamins cannot be overruled. Heilskov et al. in their study classified the skin changes into basically four groups namely: ‘telogenic effluvium, hyper- and hypo-pigmentation, ichthyosiform, lichenoid and bullae-erosion-desquamation changes.’ They further developed a scoring system establishing prognosis from these changes, in which the lichenoid form was associated with the risk of death. 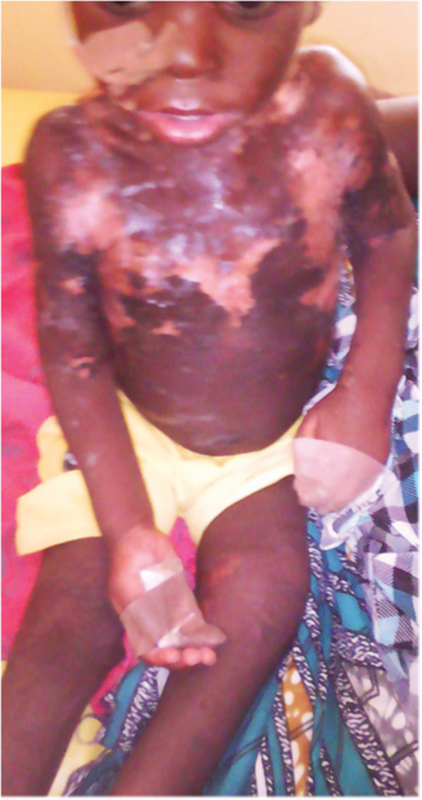 However, the cases of mixture of all these skin lesions may also be experienced; therefore, the case of a 12-month-old boy, who had mixture of these cutaneous changes with denuded skin appearing as burns, is highlighted in this communication. He was delivered at term in a family of 10 children. Both parents were not educated; the father was a subsistent farmer, while the mother was a stay-at-home mother. He was not exclusively breastfed, and he had a history of recurrent loose stools. Pap-based diet was introduced at the age of 4 months. The mother noticed a progressive poor weight gain, and 2 weeks to presentation, he developed dryness of the skin, which became thickened with increased pigmentation. Five days later, there was an extensive peeling of the skin exposing raw surfaces − affecting the anterior and posterior surfaces of the trunk and upper limbs − which appeared as burns (by estimation, about 60% of the body surface) [Figure 1]. He also had sparse thin silky hairs, and his anthropometry was deranged with weight of 6 kg, length of 70 cm and mid-upper arm circumference of 11 cm. We gave him nutritional rehabilitation and oral zinc with multivitamins; the open burns wound care was adopted, and the wound was cleansed with saline and topical antimicrobial such as 1% sulfadiazine cream was applied. He had significant improvement and healing. He was discharged at the 6th week of admission. Therefore, our index case manifested all the grades classified by Heilskov et al. ; however, with meticulous attention to feeding and skin care, the patient made a remarkable improvement. The care of the skin, which is often overlooked, could have contributed to the survival of the patient. The skin forms the barrier to invasion of pathogenic organism; therefore, the loss of skin with accompanying immunosuppressive state due to SAM heightens the risk of severe infection and death. Therefore, incorporating the management principles of burn wound care in PEM cases with extensive skin lesions may improve their outcome. WHO. Malnutrition − The Global Picture. World Health Organization. Available from: http://www.who.int/home-page/. [Last assessed on2017 Mar 14]. United Children Emergency Fund Data. Monitoring the Situation of Children and Women. Undernutrition Contributes to Nearly Half of all Deaths in Children Under 5 and is Widespread in Asia and Africa. Available from: http://data.unicef.org/topic/nutrition/malnutrition/. [Last assessed on2017 Mar 14]. United Children Emergency Fund Nigeria. Available from: https://www.unicef.org/wcaro/Countries_1320.html. [Last assessed on2017 Mar 10]. Baqui AH. Diarrhoea and malnutrition in children. Replacing fluid and minerals, particularly zinc, remains vital. BMJ 2006;332:378. Available from: https://www.ncbi.nlm.nih.gov/pmc/articles/PMC1370961/. [Last assessed on 2017 Mar 10]. Heilskov S, Vestergaard C, Babirekere E, Ritz C, Namusoke H, Rytter M et al. Characterization and scoring of skin changes in severe acute malnutrition in children between 6 months and 5 years of age. J Eur Acad Dermatol Venereol 2015;29:2463-9.